kubic is a unique minimalist puzzle game based on M.C. Escher's art, impossible objects and other geometric designs. The object is to construct the goal configuration from a number of pieces. 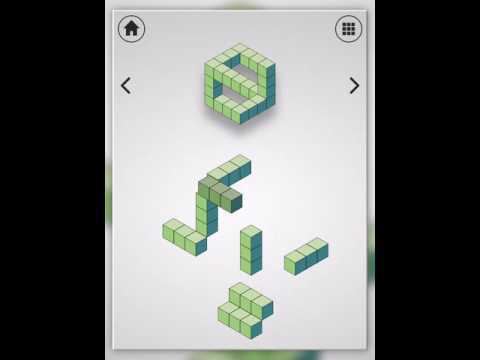 Presented in a simple, clean design and minimal art, kubic is a minimal puzzle game with over 60 escher-esque puzzles. If you truly get stuck, there is a in-game hint system. You can use it to get started or even get the whole puzzle solved. Tip: It helps to plan ahead and build figures from back to front. • Ocean (Blue) - "2D" Shapes are basically two-dimensional arrangements. • Desert (Orange) - "3D" Shapes appear to be three-dimensional, but remember to think in two dimensions. • Mountain (Purple) - "Convex/Concave" These optical illusions are inspired by Escher's famous "Convex and Concave" lithograph. • Sky (Green) - "Up/Down" These optical illusions are inspired by the Penrose Triangle featured in Escher's lithograph "Waterfall”. • Escher (Mixed) - Based on letter designs that spell out MC ESCHER. • Print - Based on the printable magazine version of Convex-Concave puzzles. Convex Concave puzzles from the Heaven and Earth game are included with permission. The puzzles were designed by Scott Kim, Puzzlemaster (scottkim.com), and the Heaven & Earth team. Game supports Google Play Saved Games service for progress syncing between devices.